Heartbreaking sale of my 16 year old Bay Gelding Nero. Nero has been a pleasure to own and is very easy to do in all ways. 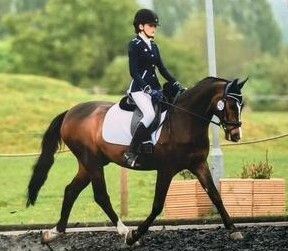 Recently I have been doing dressage with him, affiliated up to Novice and have been placing consistently. He has competed at Sheepgate gaining scores of 62%+. Nero also enjoys jumping and has previously competed up to 90cm with me. He enjoys cross country and has a bold jump, so he really is a true all rounder. Nero is quick against the clock in a jump off. Easy to load, shoe and clip. Nero needs a strong rider who can bring out the best in him, but he truly is a great confidence giver. He would make a great 1st pony. He is a gem to hack and is never silly. Nero is a very gentle pony with a wonderful temperament.